I was fishing with an individual who was an upper level angler. An upper level angler in my boat is a feller, or gal, that fishes a bunch. For me that means upwards of 100 days a year. This feller fished quite a bit. His goal was to continue to learn. To move to the next level. I could see that he was interested in continuing to improve every time he fished. For an angler to progress he has to fish with educators, anglers that are better than he is, and fish on his own. It requires all three of those components to improve. The primary trait for improvement is a want, a desire, a drive to improve. That is the difference between those who will get better, and those who will not. Most of the anglers I fish with do not have the desire or want to improve. I think that is true of most fishing guides. Most anglers in guide boats are those who are on vacation, and are interested in fun, fellowship, and a few fish to the net. Some of them want to use the net a lot. But they really don’t want to work on the fishing craft. The goal of most fishing guides is to improve the angler through education. The angler has a unique opportunity to glean lots of pertinent information about resource. I know that I am the type of angler that beats up the guide with questions and inquires and the like. I want to grow through the experience. I want the guide to help me get to that next level. But that is not the case with everyone. And this is the first year that I truly grasped that concept. A foreign one to me. I thought we all wanted to improve. My favorite comment this past summer was from a couple of friends who fished with me in September. I was speaking to the guest in the front fo the boat about mending and the importance of a “dead drift”. I was relaying the concept of moving/sweeping the rod accordingly to keep the bobber, hence the fly, at the same speed of the current…therefore putting the bait in front of the fish for long periods of time consequently presenting the fly properly parlaying our catch rate. And that is when I stopped talking. I did turn to his friend in back of the boat and he just gave me a shrug saying that he was interested in any tips and suggestions of how to improve his entire fishing game. I guess there is one in every crowd. Learning is difficult. It requires energy It begs you to change some of your behaviors. Learning leads you down a path that means you may regress for bit before the light bulb moment. Then, and only then can you move forward. Regression is the inevitable painful first step to progression. Some anglers are not interested in any part of that sometimes difficult process. I see anglers in the boat just are not interested in learning. A fact about guiding anglers is that some anglers are interested in the Disneyland experience. Guide Ben Hardy and I have discussed this ad nauseam. Just like an amusement park ticket…you pay your money and you get a chance at catching fish. 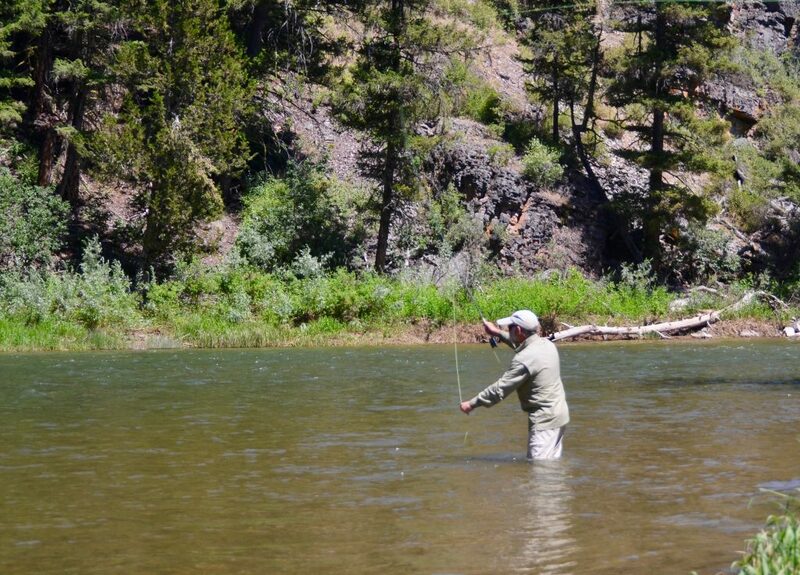 The thing about fly fishing is that for the most part it requires participation from the angler. I also, as Ben has reminded me repeatedly over the past 11 years, believe that the Missouri River is a spoiler. Lots of fish per mile. Great fishing guides. Great fishing guides that when you are engaged in the nymph pursuit rowboy does high percentage of the work. Rig the rods, find the depth, adjust the bobber, and run the boat down the tertiary shelf line, where the majority of the fish reside, and get the net out. And that is OK. That is part of guiding anglers. But not all anglers want that kind of experience. A bunch do. The other faction is interested in raising the bar on their own game. The reason I wanted to write this blog in the first place was not the info above. It was the realization that good anglers develop skills that work for them. The case in point is this: I fished a fellow, that was catching fish while streamer fishing. I did not like the cast or the presentation much. It wasn’t bad, it just isn’t how I would go about it. But the dude was catching trout. And that is good. Just because it was not how I would go about it, does not make it bad. And that is the first time that I thought about that. I am charged as a fishing guide to facilitate the clients needs. And sometimes that is rowing the boat and netting fish on a nymph. Sometimes the guide is the cheerleader. Sometimes the guide is an armchair psychologist. And even sometimes a fishing guides role is teaching. I mentioned to my guest that his technique was solid, but it was not how I would approach the task. It was the first time that I recognized this. Boy I hope I did not beat up too many people over the years over this. Ahh, many are not interested in education, so I’m sure I didn’t bother too many. Lots of times men don’t listen anyway…so no harm there. The tricky part is to keep caring. To not become cynical. To not confuse the lack of interest in learning with lack of excitement. You can have both. Honest. Those are two separate things. Yes, still learning after all these years. Still excited about guiding anglers. Damn excited about those anglers who want to learn. The most fun any guide can have is to fish with anglers who are interested in learning. I am energized and excited about being a fishing guide. A rewarding career. I wouldn’t rather do anything else. My office is the rowers seat. The view is awesome. The stress level is low. Non-existent from my perspective. They are just trout. Some days they eat it, and others they don’t. Totally out of our control. The only two things you can do to improve your catch rate is learn, and go fishing a lot! I will remind myself to let those skills go that don’t need changing. And there are a lot of them. I am much more aware of that fact now, now that I have had the revelation this past summer. Teach only those who want to be taught. It may be wasted breath to continue to beat up those anglers who have no interest in learning. And I will not get as frustrated with the guest. They may only want a cool boat ride with a good lunch and some relaxation, some fellowship, and no pressure.